Read more about this brand new version and download the free demo here! is now available in the Mac App Store! Use PiP to show video from any webcam on your screen, nicely integrated as "Picture in Picture" which makes it ideal for live presentations, screencast recordings and in the educational sector. PiP doesn't clutter the dock with an additional icon: After launch it automatically installs itself in the menubar and the user can define a keyboard shortcut to smoothly fade in and out the video. ... or pressing it's user defined keyboard shortcut. To change the user defined keyboard shortcut, choose this command. You can customize PiP's video view in this submenu (e.g. add a custom colored frame). These options rotate PiP's video picture by 180° resp. mirror it. Choose one of many video effect filters to be applied to the video view. This sets PiP's window level to the highest posible value. 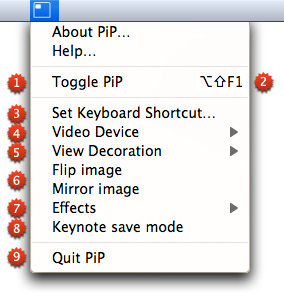 It enables you to use PiP during Keynote presentations. Please also switch on the option "Slideshow" > "Allow Exposé, Dashboard and others to use screen" in Keynote's preferences. Quitting PiP also removes PiP's icon and menu from the menubar. You can choose where the PiP window appears on your desktop: Just drag the window around while holding the mouse button down. Click & drag any corner to resize the PiP window. All changes are automatically saved. Use the standard magnetic mount or a special flexible stand to bring your external iSight into the right position for the show. 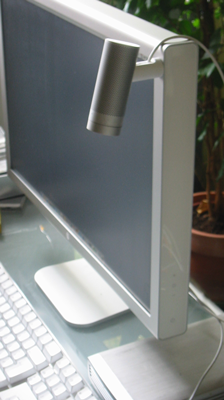 Sure enough, you can also use any Mac-enabled USB webcam or video camcorder with PiP. 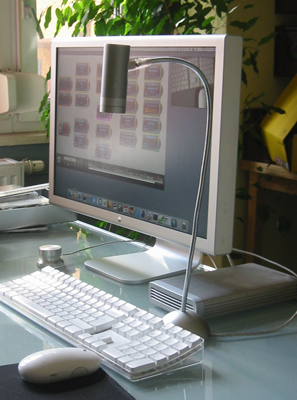 PiP 2 is now based on Apple's newest QuickTime X technology. PiP 2 uses much less system resources than PiP v1.x. The CPU load is much lower in general and virtually zero when the PiP video view is hidden. Thus, the "Disable PiP" command isn't needed any more. It's now possible to decorate PiP's video window with a custom colored frame and/or shadow. PiP now supports selected CoreImage filters (see "Effect" menu). 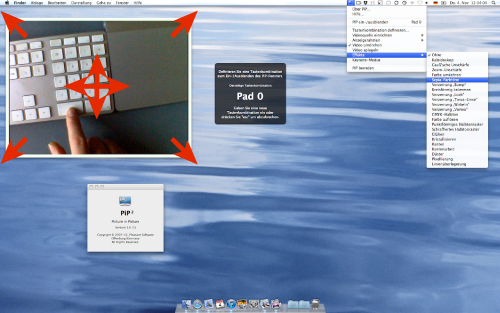 If you use an older Mac with Mac OS X v10.4 or v10.5, please have a look at PiP v1.1.